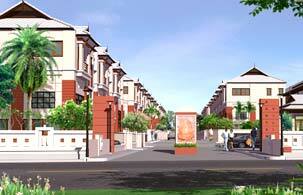 The Banyan Villa, 3 storey townhome in modern style, offers 3 bedrooms and 3 washrooms. The ceiling of the ground floor is 5 metres height. The front is composed of transparent light brown mirror with Aluminum frame. All function space is well designed to be modern and suitable for the ambiance of Southern culture. The Banyan Villa is with 6 metres x 14 metres space of land. It combines with a living room at the second floor, a dining room, a kitchen and a spacious car park. Phuket Island, a paradise of the Andaman Sea is a resort city. Due to its tropical atmosphere, it is idyllically full of the exotic and fascinating views of mountain and sea. These attract people around the world to visit once in their lives. The Banyan Villa has a uniquely conceptual design for new generation to enjoy fabulous nature and environment. We meticulously design to be a resort atmosphere including clubhouse and swimming pool. Be filled with idyllic panoramic view surrounded by beautiful landscape which can be seen through the front glass window of our houses. The Banyan Villa combines with totally enjoyable recreation and resort facilities. Relax with promenading around the public park, be impressed with various plants, lie down comfortably, zip cool drinks at the edge of the swimming pool or walk around our verdant garden in order to appreciate colourful blossoms of flowers on one of your fine days.